Thinking about sharing my love of notebooks here, I began to panic just a little. 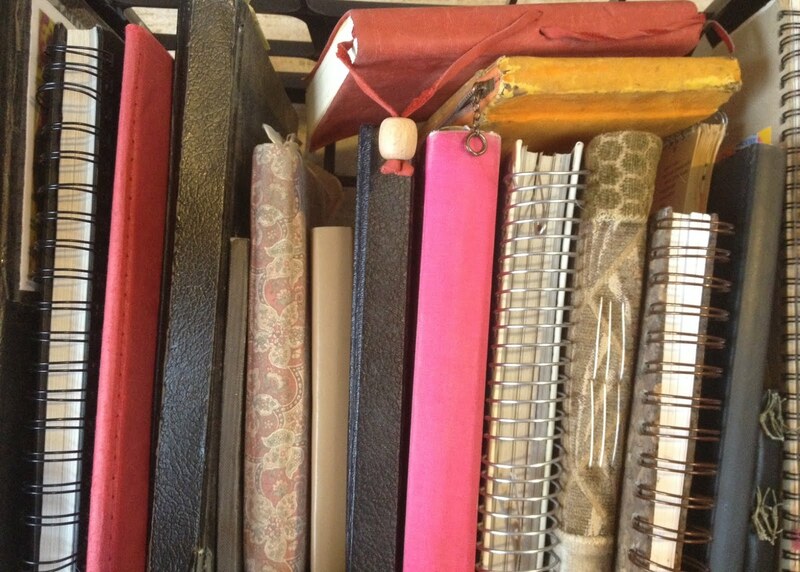 I’m not sure I have a notebook, I thought to myself, remembering all of the gorgeous notebooks I've become acquainted with on this blog. I don’t have anything worthwhile to share. I’ll bet I’m not the only writing teacher who feels this way about her writing life. Things are so busy, and at first I assumed that I was yet another victim: a writing teacher who sacrifices her own writing life to the work that must be done for others each day. Notebooks? Who has time for notebooks? Well, as it turns out, I do. In fact, I always have. Notebooks are such an integral part of my life that I just wasn't noticing them anymore. Not until now. 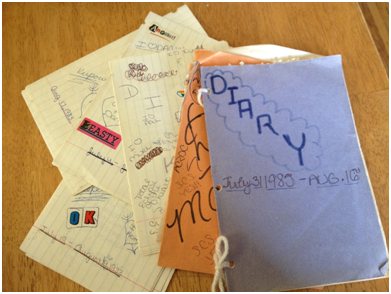 When I was young, I made diaries out of folded sheets of construction paper. When we didn't have any, I would sneak a pile of lined paper home from my desk at school. I've kept them in a box in my closet all of these years. My face burns when I read them, but I can’t bear to toss them out. These were my first notebooks, after all. My diaries had boundaries. I wrote in these books every day then, mostly about the boys I “loved”, the pets that I had, the friends I was arguing with, and why I “hated” my parents on that particular day. I was fourteen then. These were the topics that mattered to me. Writing “bed to bed” stories that captured every mundane detail of my life helped me survive it, in a way. This is how writing nurtured me then. As I grew older, I kept writing. I also began working, and every once in a while, I would splurge on a new, beautiful notebook. This is the one I was keeping when I met my husband, John. Sometimes, I revisit it when I’m writing him a present. Those memories fuel that kind of writing for me, even now. They are artifacts of some of the most important days of my life. And here’s something interesting I've noticed: as I grew older, the notebooks and even many of the entries become less boundaried. My daily writing opened up to make space for the busyness of my life, and I’m still capturing much of it in words, even though it’s often for very different purposes. I noticed this first in the notebook above. The back cover features a scribbled set of directions. 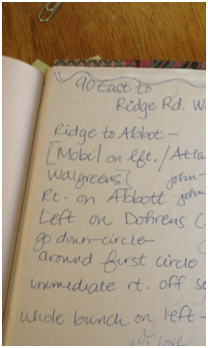 I used this page to jot down the route to John’s first apartment…the very first time he shared it with me over the phone. At the time, I needed something to write on, and I know this was sitting on my dresser, next to the phone I was speaking into (which had a cord, thank you very much). I grabbed it and wrote quickly. This was the first time the minutia of my daily life wandered into my notebook. It wasn't the last time, though. I used to feel guilty about this. Now I’m realizing that I’m glad for that. I’ve become pickier about the features I desire. For instance, my favorite notebooks are exactly this size. They have a ribbon glued into the spine, so that I can find my place easily. They have a pocket at the back, where I can shove important notes, documents, trinkets, and cards. Things I want to remember. Things I don’t want to forget. I always write in blue pen or with a fine point Sharpie marker. I use my notebook to contain my ideas. I also use it plan. I keep track of my to-do lists right beside the draft of a blog post I’m writing and lessons I’m planning for the writers I teach. And I always maintain a running list of personal writing territories at the very back of each book. You’ll find a list of fun things I want to do with my kids back there too. And movies I want to see. And books I want to read. 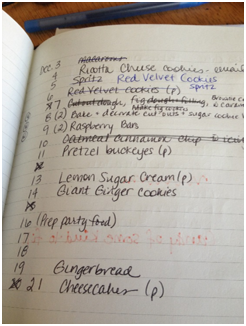 Cookies I need to bake. Plants I need to find for my garden. As my life becomes busier and messier, my notebooks have too. They've also become the central hub for all of my thinking, planning, and work—personal and professional. “I’m surprised you don’t keep all of that on your phone,” a school administrator commented earlier this year. “Oh no,” I smiled. “I can’t. There’s something about writing with a pen that helps me brainstorm and plan better.” I need to be able to move words around. This is probably why my grown-up notebooks are littered with Post-Its. I do use my phone for something else though: to take pictures of things I don’t want to forget. My photo stream has become a mighty source for writing ideas and inspiration over the years. Anne Lamott brilliantly advises writers to tuck index cards into their pockets. I used to do this. Now I point and shoot. My photo files are a different kind of notebook. And my life is a very different kind of life now, too. 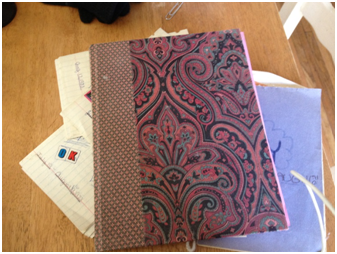 I wonder how my changing life will influence the shape of my notebooks over time. I wonder how my notebooks will continue to support the changing shape of my life. Angela Stockman found her home inside of a classroom twenty years ago. In many ways, she never left. 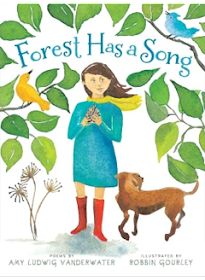 Each day, she travels to schools throughout Western New York and works beside teachers who are discovering how to help kids fall in love with words. 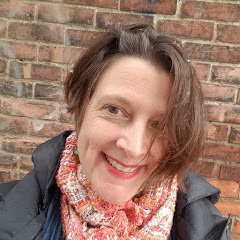 In April of 2008, Angela founded the WNY Young Writers' Studio, a community comprised of children and teachers who are learning how to use their words to make a difference in the world. 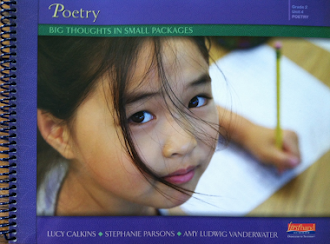 Angela has generously offered to send a copy of Gail Carson Levine's WRITING MAGIC, an inspiring book about writing, to a reader of this post. Please leave a comment and a way to reach you, and check back on Sunday, March 24 to see if you have won! Thanks for sharing the notebook story! I'll not look at my children's handmade diaries quite the same again. 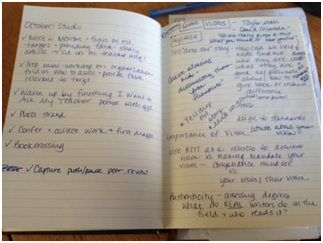 Thank you so much, Angela, for this detailed insight into your notebooks. I envy that you still have diaries from when you were young. Mine are long gone. I find it both validating and inspiring that I'm not the only person still writing on paper and in ink! I still write by hand quite a bit. It's interesting, I find that the more I'm struggling to generate or organize my ideas, the more I turn to paper to work that out. I love this entry. I have found that as my life has become busier, my notebooks have become scattered and actually more electronic. Glad to see how you have reached your balance. I haven't reached mine yet. Oh, I'm not sure I've reached that balance yet Deb : ) As I was drafting this post, I really began wondering if I keep "a notebook" at all. Like you, I keep bits of things online and scattered all about. But I think that's okay, as long as I'm keeping my hands moving. In fact I'm realizing that not being hard on myself about this reality is what does keep me writing when life gets so crazy. Thanks for sharing your notebooks and the idea of using your camera's phone feature for snapping ideas. I need to do more of that! Oh, it's fun. And my kids do the same now. I often find that a single picture generates a thousand different writing ideas. It's great to see inside someone else's notebooks & that they've begun to take pictures (so easy) to help with the note-taking. Don't put me in the running; I have Levine's book & it is good! But thanks for sharing! Writing Magic is a teacher favorite in my world. I have extra copies on hand at all times, just to give away! Hi, my name is Cathy, and I'm a fine point Sharpie addict. So nice to meet you Angela.Thanks you for sharing. 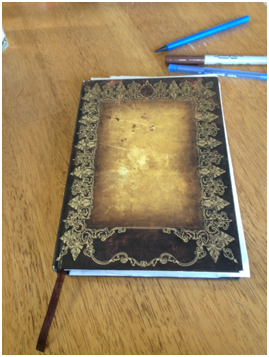 I loved reading your notebook/writing time-line: so very interesting. I have bookmarked your website as well. Looking forward to reading more about the important work that you do. They enrich mine as well : ) Nice to meet you too, Theresa! Thank you for sharing! I've been pointing and shooting and posting almost daily for almost a year now...things I love. I also keep paper notebooks as well though. So glad to meet a fellow paper and pen addict! Kindred spirits in a technological world!